The Sagaing Division trading town of Kalay pays a heavy price for its strategic location near the Indian border, as police fight in vain against a flood of drugs. KALAY, Sagaing Region — On a cloudy afternoon in June, Lt Bo Bo Win Htut and several officers of Kalay Police Station were hiding in the long grass near a bridge outside of the Sagaing Division trading town. 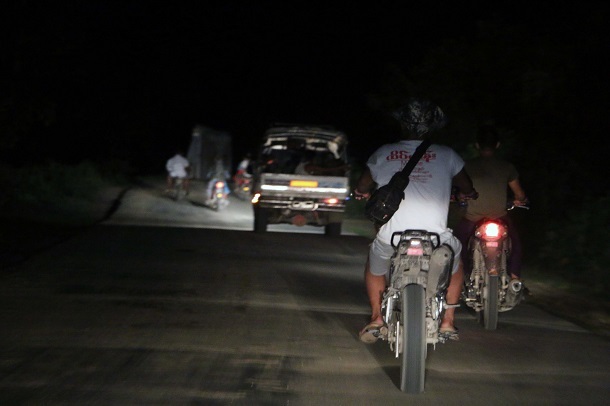 Dressed in plain clothes, and with backup provided by a local armed militia and members of the civil service, they waited to ambush a small-time drug dealer heading to Tamu, a town on Burma’s western border with northeast India located some 80 km from Kalay. As dusk fell, a middle-aged man and a young man on a motorcycle covered with mud popped up and crossed the bridge. With his hand on the pistol in his waist, Bo Bo Win Htut jumped onto the road and blocked the bike. Other officers simultaneously surrounded the two and then handcuffed them. “Give it up openly, if you have any material,” said the officer, but the men did not respond. Maung Maung, 45, was found to be carrying 1.2 grams of low-grade heroin and a bottle of what appeared to be methamphetamine pills. The young man on the bike, a 21-year-old university student named Aung Kyaw Kaung, was also taken in. After quickly questioning the detained, police sped off to West Khone Thar Village, located on Kalay’s outskirts, to find a man who allegedly provided the confiscated drugs. At 8 pm, they arrested Maung Maung Oo, a man with a criminal record for dealing, but no narcotics were found at his bamboo hut. It was June 26, the International Day Against Drug Abuse and Illicit Trafficking, and Kalay police allowed Myanmar Now reporters to join their operations to show they were combating the rampant narcotics trade in Kalay, a rundown market hub of around 400,000 inhabitants—a mix of Bamar and ethnic Chin—in the mountainous border region. In other cities that day, top police officers held their annual ceremonies to burn large amounts of seized illicit drugs. In the former capital Yangon, state media reported, US$20 million worth of narcotics was torched in the presence of representatives of the United Nations Office of Drugs and Crime (UNODC). Despite such public shows of intent, Myanmar authorities have long failed to stem the vast, entrenched narcotics trade. In lawless conflict areas in the country’s rugged north, pro-government militias, transnational criminal gangs and some ethnic rebel groups produce vast amounts of opium, heroin and methamphetamine that are destined for China, Thailand, India, and the domestic market. Much of the law enforcement response has focused on arresting drug users and small dealers for illegal possession, which carries stiff penalties under Burma’s drug laws. His officers made about 80 drug-related arrests in the past half-year, he said, adding that because of the mountainous terrain and lack of resources, police struggled to catch any ringleaders. In the last five to ten years, drug abuse has reached crisis levels among Burma’s ethnic communities in Kachin and Shan states, as well as in transport nodes and border towns such as Lashio, Muse, Kalay and Tamu. Transnational drug-smuggling routes pass through the towns. Vast amounts of precursor chemicals—such as pseudo-ephedrine, which is used to make methamphetamine—are imported illegally from India and China and flow through the border towns. In the mountains surrounding Kalay, poverty-stricken ethnic Chin farmers are reportedly also turning to opium poppies to sustain their livelihoods. On June 26, Maung Maung and his nephew Aung Kyaw Kaung, were taken handcuffed to Kalay Police Station to be photographed, along with the other alleged dealer, Maung Maung Oo. The mother of Aung Kyaw Kaung came to visit him and wept at the sight of her son in handcuffs. Just eight months before, Maung Maung had been released after serving a prison term for a drug offense. “I used to be a truck driver and got a lot of back pain from my job—that’s why I started using drugs and became involved in this business,” he told a reporter. Si Thu Win, an emaciated-looking young man loitering on Kalay’s streets, told Myanmar Now later that drug addiction was a widespread problem in Kalay. “You can buy heroin easily here—it’s much cheaper than beer,” he said, adding that he tried repeatedly to quit drugs but failed. According to data collected by the UNODC in 2014, there are 1,200 injecting drug users in Kalay, making it one of the cities with highest number of users after Mandalay, Lashio, Yangon, and several towns in Kachin State. Dr. Htet Myat Soe, a physician at Kalay Hospital who specializes in drug addiction and related psychiatric issues, said 200 addicts receive methadone at the state-run hospital every day in order to wean themselves off heroin and opium. “The main problem is that when they meet their old friends they tend to relapse,” he said. According to police records obtained by Myanmar Now, a total of 35,481 people were arrested across the country between 2011 and 2015 on drug-related charges. One of them was a 38-year-old ethnic Chin man from a village in the mountains around Kalay who only give his name as Thang. He was imprisoned in 2012 for drug trafficking and released last August. Thang explained in an interview that he was assigned by traffickers to move pseudo-ephedrine coming from India. He would pick up the precursor chemicals at various places around Kalay and bring it to a warehouse. “Then someone above me would go and carry all of those materials down to Mandalay,” he said. Kalay Prison and the prison labor camps around the city are filled with poor Chin who had become drug users and small dealers like him, Thang said, estimating that more than half the prison population was arrested for drugs. Lalremthang, a Chin community activist, said poverty among her people was driving the Chin into the trade and drug abuse. “They have nothing for their survival. So they turn to the drug trade, for which they don’t need any capital,” she said. In recent years, as sweeping reforms ripple through Myanmar’s government, there has been a growing recognition among top law enforcement officers that harsh penalties for drug users and small dealers—who often spend years in prison for possession of small quantities of drugs—are ineffective in combating the drug trade and abuse problems. Dr. Win Mar, UNODC Burma’s national program specialist for HIV prevention and care, said the police approach to drug users was slowly changing. “But drug users are sometimes still targeted during special operations,” she said. While Kalay’s prisons overflow, the drug trade continues unabated, addiction levels stay high and few ringleaders are arrested, said Aye Aye Mu, a Lower House lawmaker who holds a seat in Kalay for the ruling National League for Democracy (NLD). “Authorities hardly arrest any major drug traffickers—instead they arrest many users,” she told Myanmar Now. Aye Aye Mu said police had failed to break up drug rings because of a lack of capability and resources, or because they are corrupted. “They will definitely know the prominent drug traffickers. I wonder why they have difficulty arresting these traffickers,” she said, adding that the central government should boost law enforcement efforts in Kalay. In 2013, a special police team from the capital Naypyidaw investigated allegations of corruption in the Kalay police force. A district-level officer and several of his lower-ranking officers were later dismissed or imprisoned. Kalay Police Chief Lt-Col Tin Zaw Tun told Myanmar Now that his force was now clean, but struggled to fight the trade due to high demand from traffickers in India, who use the Indian border town of Moreh and the Reed Mountain Range in Chin State to move drugs. Kyi Ya Aung, 35, is a former addict and member a local volunteer group Kalay Lwin Pyin, which helps communities hit by last year’s devastating floods. He said the continuous influx of cheap drugs made it nearly impossible for Kalay addicts to quit, adding that he recovered after he left for Yangon, where he worked for 10 years as a trader before returning to Kalay.